We would all like to be able to get free ink cartridges when we place an order, it would certainly cut down on the cost of our ink cartridges. It’s all about being smart in the way we search for the ink cartridge when we first start looking for the cartridges on Google. If you were to type in the search bar: ’free ink cartridges in Ireland’ what is the result going to be? 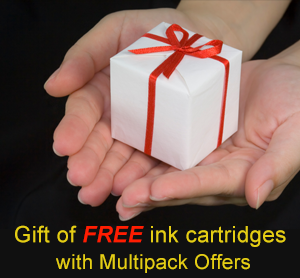 Well, there aren’t too many businesses going to give away an inkjet cartridge absolutely free is there, but there are a few on-line suppliers who will give away free ink cartridges when you order a multipack or bundle pack. These on-line ink cartridge suppliers are your best bet for getting the best deal with free ink cartridges and will drastically reduce the overall cost of buying a multipack of inkjet cartridges. Another good way to find the online suppliers who giveaway free ink cartridges is to put out a request on the social media sites such as facebook, twitter or linked-in. Just ask the question: ‘does anyone know where I can get free ink cartridges if I buy a multipack?’ If one of your friends or colleagues knows of such a place they will surely share it with you. But also, when you discover these great online suppliers you too should share it with your friends. You can go to the suppliers’ facebook page, like it, and share it with your friends. This is a sure-fire way to let everyone know about the free ink cartridges that you have discovered. Of course there are some people say that there is no such thing as a ‘free lunch’, that may be the case 9 out of 10 times but say you come across a deal where this is the one time that there is indeed a free lunch. If you are not sure about the free inkjet cartridges that the online supplier is offering then only buy a small multipack with maybe one free cartridge to test the product. Some of the suppliers will have 4 plus 1 free as their lowest multipack offer, that is an ideal one to try if you are worried about going for a large multipack such as buy 16 get 4 free. When you are checking out these online suppliers it’s always a good idea to check out their returns policy, will they give you a no quibble money-back guarantee on their ink cartridges? If they seem quite open about this then this is another reason to give them a try, as you really can’t lose out. Again though, you can maybe check out their facebook page to see if there are any comments left by people who have bought from them recently and see what sort of review they give them. With the price of an original inkjet cartridge nowadays it is good business practice for the small business and home user to check out the best deals online for ink cartridges and even better if you can find free ink cartridges in Ireland while you are at it!